This is the recipe that inspired this blog. You see, when I was a brand-new baby bride (the new harse), unschooled in the ways of crafting the dishes that were becoming my comfort food, Auntie Seta came over to our Burbank apartment, walked me to the Armenian grocery store on the corner and guided me through an introduction to the mysteriously labeled products with which I needed to become familiar (What's a Tukas? It's a brand of tomato paste, Dear.). 1. Not everyone is fortunate enough to have an auntie who may or may not have time to spare, but who lovingly makes time for you. 2. It's important for people to know their food (particularly brides married to delicious American-Arab-Armenian super-studs). 3. 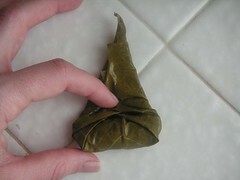 I could fill the void in the internet where step-by-step dolma instructions belong. By now this has surely been done famously by lots of knowledgeable people, but this is a sentimental recipe: it was my first mysterious Middle Eastern dish, and I'm so happy to finally share it today, with gracious permission from Auntie Seta Thomasian! *Can be purchased in international markets. A brand I commonly use is Sadaf. 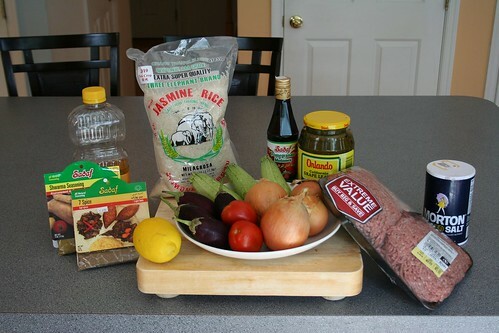 You can certainly add more of the spice blends if you prefer, but the amounts above are a good place to start. 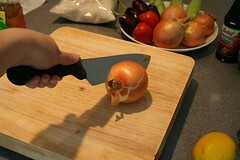 Slice the onions from one side to the core, but not beyond. 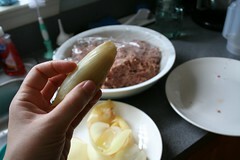 You'll wrap the onion layers around filling later. 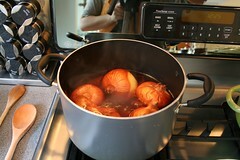 Boil the onions over high heat until they're tender but not mushy, checking every 4-5 minutes until they're ready. 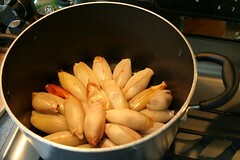 Drain them completely and allow them to cool before attempting to fill them. Slice off and reserve the tops of the eggplant, squash and tomatoes. You'll replace the little hats before cooking. Core the veggies with a paring knife and/or spoon, leaving about a 1/4 inch or less of the outermost layer. Reserve the innards because they're really good food! 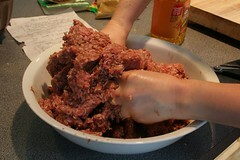 Sautee them up with some spices and any leftover meat you may have...delicious! 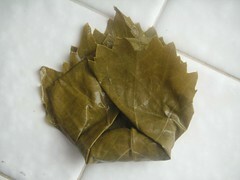 Stuff the veggies with filling (see below for grape leaf tutorial). Pour 2 Tbsp. corn oil in the bottom of each pan. Layer the stuffed vegetables into the pans. 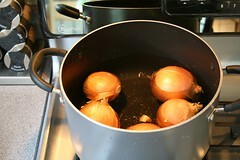 The bottom layer of vegetables in the pan should be onions, because the direct heat will caramelize the skins. 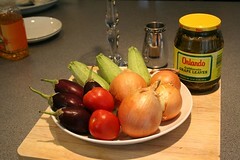 The onions are less prone to scorching than the other veggies. The next layer should be any peppers, squash or eggplants you may have filled. 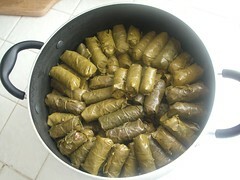 The top layers should be filled grape leaves, arranged in concentric circles. Actually, the tippy top layer should be tomatoes if you are using them, because they are the most delicate. Place two plates on top of the stuffed veggies and grape leaves. 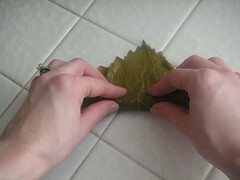 The pressure from the weight of the plates will prevent the leaves from unravelling as the dolma boils. Barely cover with water, lemon juice, pomegranate molasses. 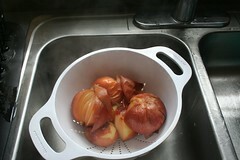 Bring to a rolling boil, reduce heat and remove plates. 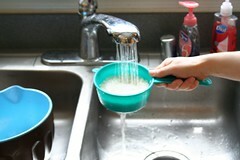 Add water if needed. Re-boil. Taste, adjust for salt and pomegranate molasses. Keeping the water level high enough to thoroughly cook the rice but low enough so that when you're done, you have a nice reduced sauce and not a soupy mess is a bit of a dance. Keep your eye on the water level. 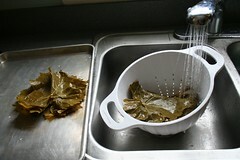 The jarred grape leaves should be thoroughly rinsed before use. If a leaf is too large, just slice it in two pieces...waste not, want not. Slice off the woody stems before rolling as they're not pleasant to bite into. 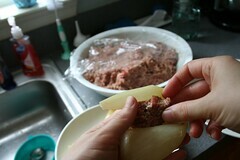 Roll them somewhat loosely as the rice in the filling will expand while cooking. Smaller rolls are considered daintier and most fit for company. On the other hand, life is short and you are likely busy...so if you want to save time and make larger rolls, I won't judge! Friends, the brands here are the ones we like. Please use what you like and have access to; don't get hung up if you can't get the brands I've listed here. 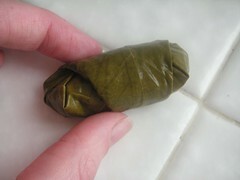 I can't even get them all the time, depending on where I live, but the last thing we want to do is not make this dolma! Remember: everyone who cooks has the right to do so according to their family's taste! love this Bethany! what a great blog. 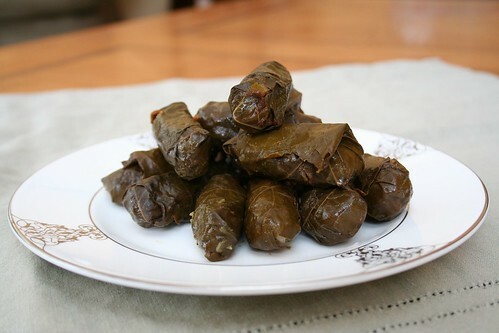 Every family's Dolma recipe is a little different - and yours looks great! 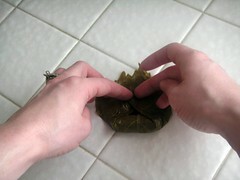 I recently made a 6-page Dolma recipe with step-by-step photo tutorial for my family. 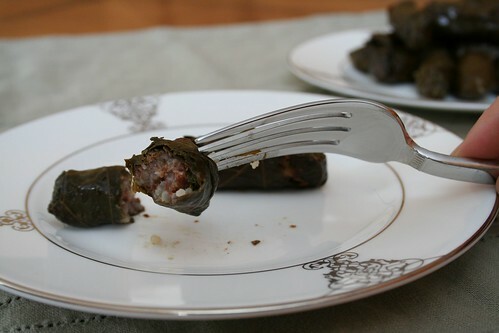 Onion Dolma may be a specialty of Iraqi-Armenians! My Mom taught her friends (non-Iraqi Armenian-Americans) how to make Onion Dolma - of course they had their own family Dolma recipes, but never heard of filling onions. Unbelievable how sweet the onions are! Keep up the good work - I'll check back often!